A pleasant surprise, I admit. I first saw a copy of this book on my library's (used) bookshelves for 25 cents but even that ridiculously low price didn't tempt me enough to purchase it. I didn't want to get stuck with one of those heavy, portentous, late Victorian tomes that would render me comatose. Then, however, I watched this version of the book. The plot looked interesting so the next time I was browsing the library's shelves I took the 2-bit plunge and bought the book. And I'm glad I did. 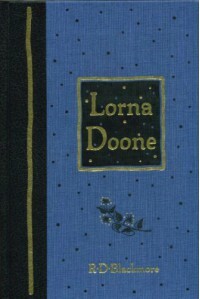 From its first pages, where a young John Ridd unknowingly meets the young girl who would become Lorna Doone, to John's final fight with the savage Carver Doone, murderer of his father and attempted ravisher of Lorna, Lorna Doone is a fast-moving, improbable but delightful adventure. John Ridd, our narrator, is a stolid, peace-loving yeoman farmer who desires above all to live quietly on his farm with the woman (and the family) he loves. But circumstances conspire to place "obstacles" in his path. The coincidences that bring John and Lorna together, split them, and then join them once again are outlandish but you don't care since, first, you really like both characters and are rooting for them the entire time, and, second, Blackmore's writes sprightly and assuredly; its a pleasure to read. And peppered with acerbic comments about women, law, religion, village life, and other aspects of English society (some examples of which can be found in my update feeds). Recommended for those who like the novels of Rafael Sabatini and others like him.